Derrick Nix and his teammates had an awful defensive game against Zeller & Co. (AP). Every once in a while Michigan State's defense looks tired. 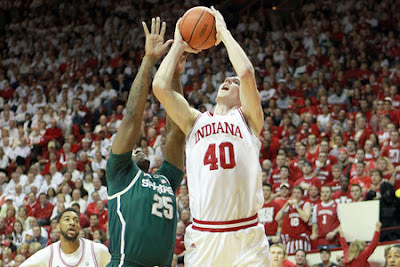 Tuesday at Assembly Hall in Bloomington, Indiana, was one of those nights. Indiana could seemingly do what it wanted offensively, becoming the first team to score more than 62 points against Michigan in a dozen games. The 70-55 Hoosiers victory coupled with Ohio State's win over Northwestern on Wednesday night means the Spartans need to beat the Buckeyes in East Lansing on Sunday to win an outright Big Ten Championship. Here's a fact: A defensive performance against Ohio State in any way mirroring MSU's game against Indiana and the Spartans will undoubtedly have to settle for a shared crown. *The DRtg is most important part of a defensive score sheet as it is the analog of an offensive rating. If a player was on the floor for 100 of his team's defensive possessions, the DRtgcalculates the number of points the opposition would score. The only other game MSU's defense was torched was an 81-74 loss at Northwestern. MSU's team defensive rating (DRtg) that game was 123.7, so technically MSU played slightly better with Tuesday's 119.5 DRtg. That said, the biggest similarities in individual defensive performances were horrible games by Adreian Payne and Branden Dawson. Those two are MSU's most athletic bodies and when both are lost on the defensive end, MSU suffered. The Northwestern and Indiana games are prime examples.